Hi everyone, it's Kirstie from Kimamely Beauty here. Huge thanks to Parie for letting me share this post with you all. This is actually a Summer Essentials collaboration, so she's sharing her melt proof makeup must haves over on my blog too! I'm covering the body element of getting summer ready, so grab an ice-cold cocktail, pretend you're lying on a tropical beach and enjoy! Summer is the season I live for, not only for holidays, but for all the beautiful products that it is finally seasonally-appropriate to use. But that doesn't usually stop me, I'm smelling of coconuts all year round, craving that summer vibe. This year I've made some incredible body product discoveries; here's an edited-down version of what's been sweetening my summer and giving me the glow. Although it's a year-round favourite for me, coconut scented products always conjure up images of tropical seascapes. I've been using Hawaiian Tropic for years, so the scent always takes me back to holidays abroad. The latest product in my stash is their Coconut Aftersun Body Butter (£10.99). It has a thick, creamy consistency that is both soothing and hydrating, and the scent is incredible. For all cooling purposes, The Body Shop Virgin Mojito Body Sorbet (£8) should be your first port of call. I love its delicious zingy scent, and kept in the fridge, it is a refreshing antidote to a long day spent in the sun. Shower time is well taken care of by Yves Rocher. I've gone mad for their Monoï de Tahiti Lagoon Hair & Body Wash (£3.20). It has the familiar undertones of the coconut scent we know and love, but has a sophisticated and exotic twist. It's the kind of product I'd expect in an expensive Caribbean hotel. Another product from the Monoï de Tahiti range that I'm obsessed with is their Precious Dry Oil (£14.90). Perfect for nights out, this beautifully scented dry oil will add a subtle golden glow to boost your tan, making you look irresistible! Talking of tan, we're all about staying safe in the sun and faking your glow. The pale girl's dream has arrived in the form of the St.Tropez Gradual Tan In-shower Lotion (£14.50), but if you're not of the pasty variety, you may want to opt for a tanning mousse. I'd recommend the Vita Liberata NKD Skin Superfast Tan Mousse (£14.95). Sunkissed skin in an hour? Yes please. As body parts go, feet just aren't nice. But there are a few things you can use to help them on their way. Summer = sandal season, and no one wants flaky feet. Soap & Glory Heel Genius (£5.50) is a foot cream with a nourishing balmy texture. It helps to soften dry skin to give a little bit of life back to lacklustre tootsies. I've been going mad over the Tea Tree & Peppermint Deep Moisturising Foot Packs (£1.96) recently. Slip a pair of these pre-soaked socks on and your feet are cooled, soothed and moisturised. Yes they might look a bit silly, but your feet will thank you. They're a must after long summer nights spent partying or lazy a afternoon's sightseeing. 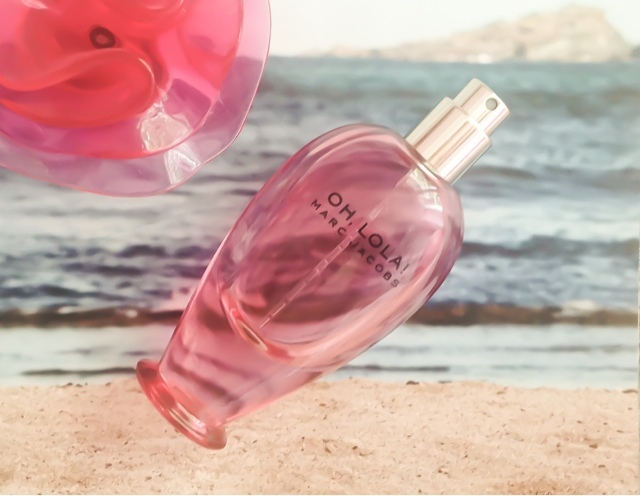 Finally, a spritz of a summery scent always brings back fond summer memories. Why not pick up a perfume in duty free before you head to your destination? The scent will forever remind you of that trip! For me, the fruity and feminine Marc Jacobs Oh, Lola! (£39) will always take me back to being in Zante last year. It is lightweight and refreshing, so makes a great summer scent, and with it's combo of raspberry, pear and peony, it smells a bit different to a lot of other fruity florals on the market. I hope you guys have enjoyed reading my summer essentials! It's been great fun collaborating with Parie, don't forget to check out her post over on my blog, Kimamely Beauty.